So, you guys. I’ve recently started a column for the wonderful Caught by the River website, based on my wanderings (and wonderings) around and about the lovely River Taff. I know, can’t I write about anything other than Cardiff, amirite? Anyway, two weird things happened after the piece was published. Firstly, after living on the edge of south Cardiff on “Rat Island” for nearly seven years and having NEVER seen a rat down here, I saw TWO within the space of two days – one running across the car park in Morrisons and one scurrying around in the bushes on Dumballs Road. Wait … there’s more … secondly, what I thought was just a little bit of basic desk research into what is essentially a fluff piece about the place I live got way more complex. It turned out to be the question that kept questioning, itself, other people, and me. In the piece I wrote for Caught by the River, my conclusion was that no one really knows where Rat Island was exactly, but that we have a rough idea (based on all my research): it was the land that lay between the River Taff and the Glamorganshire Canal, to the south of where Clarence Road Bridge is now. This is the conclusion I had come to from all the many things I’d read, personal accounts, articles on the BBC, Wales Online, modern history books, etc. Fine. You can’t actually see Clarence Road Bridge in the map below – it hadn’t been built at this point (1879). But roughly halfway down the picture, you can see James Street on the right hand side – imagine that carrying on to the left (westwards) and going straight over the water into Grangetown. That’s the horizontal line we’re talking about, just above where it reads ‘Dumballs Marsh’. But no, not fine. Writer, poet, historian, all-round good guy Peter Finch has done all of the due diligence with respect to Cardiff history when researching for his Real Cardiff books (recommended reading, students), and he responded to an email I’d sent him asking if he knew where the spot was with this: the general area was right – it was between the Taff and the canal, but rather than being south of where Clarence Road would eventually be built, it was actually north (up towards where the centre of town is): in between that bridge and the timber ponds, on an actual island created by the Taff, oxbowing its way down to the Severn and the sea beyond. The Taff has always moved about. Thrashed about perhaps, as it traverses its delta. Rat Island, as I understood it, was a section of Taff’s bank made an island by the river ox bowing itself. This was upstream of Clarence Road Bridge near The Dumballs. It was formed, according to Mary Gillham, following one of the periodic floods that plagues the Taff. Gulls and other birds nested there. Rats invaded along a revealed at low tide causeway in order to steal their eggs. The land became rat infested. The name followed. But there’s a reason for that. All of the folks I asked – people who used to live here, and had the story handed down from parents or grandparents – had heard the area was called Rat Island because of the rats that were disturbed either when the HMS Hamadryad first to the area (in 1866), or when she was finally dragged away to be destroyed in 1905. @OldCardiffPics Wasn't it named 'Rat Island' after the Hamadryad was broken up? The story we were told was that the rats came from the ship. It makes sense, but the area being referred to is south of the Clarence Road Bridge: quite a lot further south … and adding to the confusion, I had read somewhere else the area was already called Rat Island, long before the ship came to Cardiff in 1866. The discrepancy between the locations – north of the Clarence Road Bridge, versus south? I raised the possibility of the name referring to an area north of the bridge with the Cardiff Docks Remembered Facebook (where people share memories of the area and discuss such matters) and it was pretty much universally poo-pooed. No way, said people who had grown up around here. Their truth was in the tales from their parents and grandparents, and they had been definitively told. Rat Island was south, the area next to the Sea Lock, that would eventually turn into Hamadryad Park. We aren’t debating the European Convention of Human Rights or anything here guys. I am well aware this is a long gone name for an area that bears no resemblance to the marshy hinterland that inspired it – but that doesn’t stop me wanting to know WHY, does it?? Here’s my theory. The entire area that fringes the main urbanised docklands – from the Bute Ironworks all the way to the south and east, where you can see the HMS Hamadryad hospital ship – would have been a muddy, marshy wasteland at that time – its only purpose really to keep people with infectious diseases away from the overcrowded docks and Tiger Bay. There was very little of interest on any of that land – either north of the future Clarence Road Bridge, or south of it. So … it’s possible that the one spot was originally named ‘Rat Island’ – the small island next to the Ironworks, as pointed to by Peter Finch – but the name spread down (or was re-used) in the south, once the HMS Hamadryad showed up (or was hauled away), spreading its ratty citizens across the undergrowth that is now Hamadryad Park. I won’t hold out for my Nobel Prize. But I did feel like I might have actually sort of solved something that’s been bugging me for ages. Rat Island, the geographic island, i.e. a piece of land with water on all sides is the place you’ve spotted on your map. This is the one Mary Gillham suggests had birds nesting on it whose eggs were stolen by rats. Then there’s the local name for the whole district. Bill Barrett who died in 2013 and who was writing his piece on Rat Island for the Cardiff Book #3 (Stewart Williams Publishers) in 1977 suggests that all the land between the canal and the Taff was known as Rat Island. He suggests that this went as far north as the Timber Ponds. These were where the Iron Works are shown on your map … it does seem to be probable that the whole slab of land took on the name of the island. So, Bill Barrett (RIP) might have got there before me. I wasn’t able to find a copy of his book anywhere (I’m on the lookout – please tell me if anyone finds one), but I’m happy enough with the result. Big thanks also to Peter Finch for indulging me. His latest book, The Roots Of Rock From Cardiff To Mississippi And Back, is available from Seren now, priced £9.99. View Peter Finch’s archive. 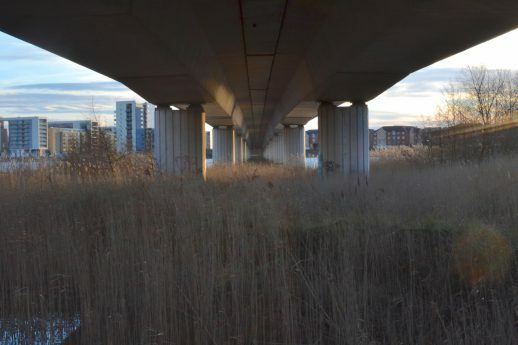 Images in this piece: both taken on the section of the Taff that runs through the now disappeared Rat Island: Instagram malayabbasi and heatherpatterson. Thanks for the mention of my photo! I first heard about Rat Island from one of the tourist guides and I was shocked. Not once have I seen a rat even before the link road was built and when the Hamadryad were marshes. Although if you look closely along the river bank fences there are lots of black boxes to control vermin. Rats are everywhere. You are more likely to see them now the weather is turning colder. Mary Gilham is the source – three very detailed volumes of ‘A Natural History of Cardiff’. Th ‘island was in an estuary so would have shifted, disappeared, come back, relocated etc. depending on tides and storms.